As far as relaxing beach holidays go, Iceland’s Reynisfjara Beach wouldn’t be at the top of an ordinary beach getaway list. 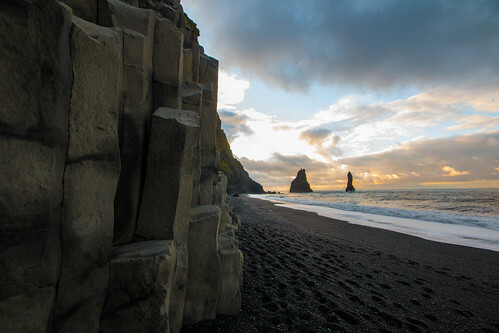 For one, it’s Iceland and nearly always chilly, and two, Reynisfjara’s shores are less white sand and more lava pebbles. When it came to choosing a destination for my first #Take12Trips challenge, the choice was easy. Only 1 1/2 hours on the train from London, with beautiful scenery, food and cozy pubs to escape the torrential rain, what better choice than the Cotswolds to celebrate the Valentine’s weekend? The village of Broadway in particular, with its busy (for the Cotswolds, anyway) high street, central location to popular walks and cultural centres, not to mention great choice of pubs, was the winner and so it was on Friday afternoon we giddily left work early and trundled through the countryside from Paddington. Despite there being only one main street, we managed to get lost soon after our arrival in Broadway, which didn’t bode well for the rest of the weekend. Fear not, as a hard slog up Fish Hill soon brought us to our accommodation, the Farncombe Conference Centre. Situated on its own 400-acre estate, the Farncombe offers rustic-styled accommodation at decent rates. However, it’s the estate’s panoramic views of the Cotswolds countryside and Broadway village that’s the clincher. Our day began with a four-mile circular hike to Broadway Tower, a Victorian folly created by Capability Brown and a favourite of artists such as William Morris and Rosetti. With the night’s rain suitably muddying our trousers and boots, we doggedly followed the slippery trail up to Broadway Tower. The muddy ground didn’t stop others either, as some of the Tower’s locals ventured out from their huddle to meet us. After veering slightly off the trail, we discovered a deer enclosure nearby, and spent several long minutes quietly creeping up to the fence for a peek.Our efforts were eventually rewarded though, as we spied a group of them gathered under the tree before they sped off upon sight of us. My piece of advice for seeing them? Keep your eyes peeled and your footsteps soft, as the deer sightings are a blink-and-you’ll-miss-it moment! Further down the trail is a paddock of horses, which were earnestly chowing down on their breakfast and only paid us the slightest bit of attention in hopes of more delicacies. Now, I was never the kind of girl growing up that desperately wanted a horse, but these little ol’ guys were so sweet and friendly I couldn’t resist stopping to pet and feed them. Wandering down the trail, we came across an endless series of gurgling brooks, melodically flowing streams and quaint manor houses and cottages that are iconic to the Cotswolds. Arriving at the end of the walk, Broadway High Street, we quickly scouted for a lunch stop and settled for Tisane’s Tea Room. With cosy nooks to take the weight off your feet, roughly 342342541 varieties of tea, and friendly staff, we quickly tucked into hearty portions of beans-on-toast and quiche, finishing just in time for the afternoon’s main event. Watching England beat Italy was only improved by our surroundings in the Crown and Trumpet pub, a quirky and fun-loving establishment that was voted CAMRA’s Pub of the Year in 2012. With its good selection of beers, ales and ciders, friendly staff, and their own pub-cat, it is the type of place that makes you yearn for somewhere like it closer to home. After getting ourselves in a suitably jolly state for woodland ramblings, we continued to explore the surrounding Broadway countryside, eventually stopping on the hillside to admire the view. In the past thirty years, Qatar’s skyline has been in a constant race, with the skyskrapers competing between each other for first prize in height and elaborate nightime displays of flashing lights and decorations. It is difficult to believe that only a short time ago, the Sheraton hotel was the tallest building in the capital city. Indeed, there are residents in Doha that can still tell you about a time before all the skyscrapers existed, when Qatar was better known for its pearling industry than its status as a cosmopolitan city crowded with luxury hotels. While Doha’s skyline has been rocketing, many of the country’s traditional pearling and fishing villages in the north are crumbling. Abandoned in droves by those looking for the promise of wealth in gas money, driven by necessity after freshwater sources ran dry, or forced out to look for work elsewhere after Qatar’s pearling industry declined, the village architecture and location offer an insight into an earlier and more traditional way of living in Qatar that is unseen in Doha. In truth most of Qatar’s inhabitants reside in Doha, with only a small population living in suburban developments in the northern area called ‘Al Shamal’ and communities just outside of Doha in Al Wakra, or to the far west of the peninsula. Today many of these villages, like Al Jumale, Al Khuwair and Al Areesh, are now designated archaeological sites under the protection of the Qatar Museums Authority, and they continue to act as a rest stop for many people that drive up the coast to Zubarah.